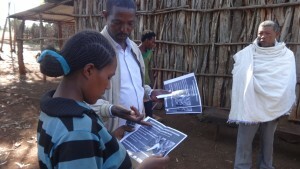 For community health extension workers (CHWs) in Ethiopia as elsewhere, educating smallholder farmers on the importance of protein is a continuous task year in year out. And it is not that the farmers do not know of its importance. The big problem has been affordable protein within the reach and means of smallholder farmers. Now, however, life is getting easier for CHWs in Ethiopia thanks to quality protein maize (QPM), a pioneering technology developed several decades ago by CIMMYT scientists (see here and here). QPM is the first biofortified crop improved for its protein quality. Biofortified crops are particularly appropriate for combating under-nutrition in rural households that mostly consume their own produce and prepare traditional foods using these staples. 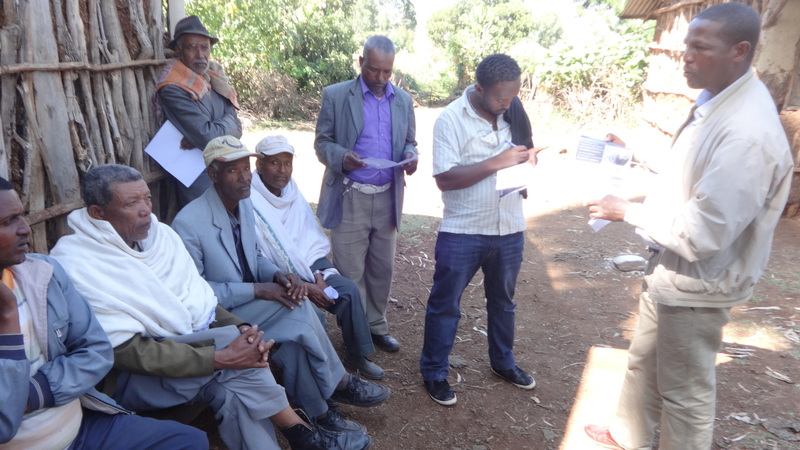 QPM is now being widely promoted in the country by CIMMYT’s Nutritious Maize for Ethiopia (NuME) project in collaboration with many national partners. But what is significant about QPM? Imagine telling an extremely poor farmer in the Ethiopian highlands, where cereals are the main crops, to source family protein from meat and eggs, when it is obvious that these are foods far beyond their means? Yet this is the frustrating scenario that CHWs have been facing for years,-until QPM came along. Developed over two decades of meticulous breeding from the late 1970s to the early 1990s, QPM contains enhanced levels of two essential amino acids whose daily intake is necessary every day for both people and monogastric animals such as pigs, fish and poultry. Studies confirm QPM can improve the nutrition and health of people whose daily diets are dependent on maize, especially young children who require more protein for body growth and development. NuME is a five-year project initiated in 2012 with funding from the Department of Foreign Affairs, Trade and Development of Canada. It is aimed at improving the food and nutritional security of rural Ethiopian farming communities through the promotion and expansion of QPM backed by improved agronomic practices that increase productivity (see Project Implementation Plan). NuME also links directly or indirectly with sister CIMMYT-led projects being implemented in Ethiopia and the eastern and southern Africa region, as these projects are sculpted around issues and constraints facing the entire maize production and value chain. Among these constraints are:· drought, addressed by Drought Tolerant Maize for Africa Project;· sustainable maize cropping systems and resource degradation, addressed by the Sustainable Intensification of Maize–Legume Systems in East and Southern Africa Project; and· post-harvest grain losses, addressed by the Effective Grain Storage Project.These projects are implemented with the same partners as NuME, particularly the Ethiopian Institute of Agricultural Research. This increases and enhances opportunities for more collaboration and synergy. Though maize ranks first among cereal crops in productivity and total production volume (in tonnes) in Ethiopia, conventional maize is a poor source of protein, being deficient in in two essential amino acids, lysine and tryptophan. NuME’s goal is to bring QPM to rural maize producers in the Ethiopian maize belt and beyond where maize is a staple food and the population there – especially young children and women – are thus at risk of lysine and tryptophan deficiency. In promoting QPM, NuME is building on the achievements of the previous and largely successful Quality Protein Maize Development (QPMD) project, which too was funded by the Canadian Government. The project introduced QPM technology in Ethiopia as well as in Kenya, Tanzania and Uganda-between 2003 and 2010. NuME’s comprehensive approach to enhance food and nutrition security in Ethiopia rests on three crucial pillars. The first is dissemination, which is implemented in large part by Sasakawa Global (SG) 2000 and aimed at increasing awareness and adoption of QPM through crop demonstration plots and field days including QPM utilization in traditional dishes. “We conduct food demonstrations during field days and provide off season practical food preparation trainings to show farmers’ that QPM could be made in to different food products as the normal maize.” says Dr Senait Yetneberk, a nutritionist working for SG 2000. This is backed by a highly successful participatory radio campaign implemented by Farm Radio International in collaboration with regional radio stations. The second is research, in close collaboration with the Ethiopian Institute of Agricultural Research (EIAR) to develop more productive QPM germplasm and to fine-tune agronomic recommendations that increase grain production. QPM seed production and quality control is the third pillar, implemented in partnership with seed companies, EIAR and the Ministry of Agriculture to ensure sustainable adoption of QPM through a system of assured and timely delivery of quality seed of preferred varieties. The NuME Project not only proactively seeks to attain gender parity in all QPM dissemination activities including those that are traditionally the domain of male farmers, but actively pursues ensuring opportunities for women “Gender-transformative approaches are critical for NuME project which incorporates nutrition as one of its major components and issues around maintaining the nutrition balance for a household is deemed a woman’s sole responsibility among the Ethiopian community,” says Mulunesh Tsegaye, NuME’s gender specialist. Now well into its third year, NuME is registering notable achievements in QPM promotion in Ethiopia. Since 2012, 143,747 farmers, extension workers and development officials (of which 28% are women) have attended 993 field demonstrations and 240 field days on QPM utilization. These activities are in various locations across the country’s four major regions. Researchers are fairly confident that recent releases of more productive varieties and superior breeding pipelines will lead to increased seed production in the coming years. Certified seeds of QPM varieties like BHQPY545, AMH760Q, MH138Q and Melkasa6Q are being produced by both public and private seed companies for distribution to interested farmers. So far about 13.34 tonnes of breeders’ and pre-basic seed as well as 26.96 tonnes of basic seed and 624 tonnes of certified seed have been produced. And demand outstrips supply. Famers appreciate the taste and cooking qualities of QPM. QPM-based traditional dishes are not only acceptable but sometimes even preferred to dishes made from conventional maize, making QPM adoption easy. This, coupled with good agronomic performance, enhances QPM utilization, particularly crucial for nutritionally vulnerable populations. Researchers and development agents are not working alone: last year, the Ethiopian government ruled that a minimum of 10 percent of all maize fields in Ethiopia be QPM. This decision heralds a brighter future in the fight against malnutrition for millions of Ethiopians. Importantly, this resolution will carry the impact of QPM well beyond NuME project areas.